Beethoven clearly had Mozart’s quintet K452 in mind when writing his quintet in E flat for piano and wind however despite the instrumentation and structure being the same Beethoven’s voice and methods remain very much his own, writing on a more expansive scale, creating outer movements that at times resemble a chamber concerto for piano and wind. Also on this disc is the elegant and refined Trio in B flat major, composed for the then-rare combination of clarinet, cello and piano and the Serenade in D major, Op 25, for the airy combination of flute, violin and viola. In November 1792 the twenty-one-year-old Beethoven left his native Bonn for Vienna, then vying with London as the musical capital of Europe. His plan was to study composition with Haydn before launching himself as a composer–performer. With the help of aristocratic contacts—indispensable to any aspiring young musician in Vienna—he quickly made his mark in the city’s salons, dazzling the cognoscenti with his prowess as pianist and improviser and his brilliantly original compositions. He was understandably cautious about tackling the elevated genres of the string quartet and the symphony in which Haydn, still at the height of his powers, especially excelled. But he was prepared to risk head-on comparison with the recently dead Mozart in works like the first two piano concertos, the E flat major String Trio Op 3 (modelled on Mozart’s Trio K563) and a clutch of chamber works involving wind instruments. The template for Beethoven’s piano and wind Quintet in E flat major, Op 16, is clearly Mozart’s Quintet for the same combination (piano with oboe, clarinet, bassoon and horn), K452. Beethoven’s work was probably composed in Berlin in 1796 and first heard at a concert in Vienna on 6 April 1797. But while this essentially genial, urbane music owes a debt to Mozart in general and his piano and wind quintet in particular, Beethoven’s voice and methods remain his own. Mozart had subtly interwoven the piano and the wind quartet. 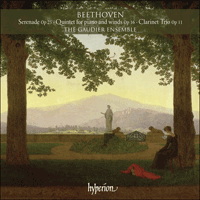 Beethoven, working on a more expansive scale, characteristically sets them in opposition, so that the outer movements at times resemble a chamber concerto for piano and wind. Beethoven follows Mozart’s plan of opening with a majestic slow introduction, though typically the rhetoric is more emphatic. Typical of the whole work, too, is the way the suave cantabile themes of the Allegro ma non troppo are first announced by the piano alone and then taken up by the wind, with the clarinet very much primus inter pares. The development immediately transforms the exposition’s final cadence in a mock-stormy C minor, with explosive scales from the piano and cussed offbeat accents, before a tense series of dialogues between the individual wind instruments against rippling keyboard figuration. Where Mozart rounds off his first movement with a tiny tailpiece, Beethoven balances his substantial development with a seventy-bar coda—though he surely borrowed from Mozart the idea of enlivening the closing stages with rollicking horn flourishes. The Andante cantabile is a simple rondo design in which increasingly florid appearances of the main theme (introduced, as usual, by the piano alone) enfold two contrasting episodes. The first opens as a plaintive duet for oboe and bassoon, while the second, in the sombre and (for the wind) difficult key of B flat minor, features a noble horn solo, interrupted by a brief development of the main theme. For his finale Beethoven follows the examples of Mozart (in the horn concertos and several piano concertos) and his own B flat Piano Concerto (No 2) and writes a bouncy ‘hunting’ Rondo in 6/8 time. There are brief hints of Beethovenian truculence in the central episode, where the rondo theme suddenly erupts in E flat minor. But otherwise the mood is one of unbridled exuberance, right down to the coda, whose teasing play with the theme recalls not so much Mozart as Beethoven’s former teacher Haydn. With an eye to increased sales, Beethoven also published the piano and wind quintet in an arrangement for piano and string trio. He likewise maximized the commercial potential of the Trio in B flat major, Op 11, composed in 1797–8 for the then-rare combination of clarinet, cello and piano but also designed to be played, with minimal adjustments, by a conventional piano trio. (Except for one place near the end of the first movement, the clarinet never descends beyond the violin’s compass into its oily chalumeau register.) Compared with the quasi-symphonic four-movement Op 1 trios composed a few years earlier, the B flat Trio, in three movements only, is a work of elegant relaxation. Or so it sounds to us. When it was published, though, the critic of the influential Allgemeine musikalische Zeitung found the Trio ‘difficult’ and reproached Beethoven for writing ‘unnaturally’! The broadly planned Allegro con brio is full of typically Beethovenian wit and ingenuity, with piano and clarinet alternately colluding and jousting for prominence. After an emphatic fortissimo close in the dominant (F major), for instance, the piano, quizzically interrupted by the cello, slyly deflects the music through D major and G minor before the expected ‘second subject’ (a shapely, dolce tune, rhythmically akin to the first) sails in on the clarinet. The beautiful theme of the E flat Adagio, a more soulful relation of the minuet in the near-contemporary G major Piano Sonata, Op 49 No 2, gives the cello its first moment of real glory in the work. There is a breathtaking remote modulation, à la Haydn, from E flat minor to E major at the movement’s centre; then, with the restoration of E flat major, the main theme is gradually appropriated by the clarinet against glistening keyboard figuration. It was probably the Viennese clarinettist Joseph Bähr, for whom Beethoven wrote the Trio, who suggested the theme for the variation finale: a favourite number from Joseph Weigl’s new comic opera L’amor marinaro (‘Love at Sea’), premiered in Vienna in October 1797. According to his pupil Carl Czerny, Beethoven often contemplated writing an alternative finale, presumably because he found the original too lightweight. In fact, these nine variations are among the most inventive in early Beethoven. Highlights are the spare-textured No 2 for clarinet and cello alone, the two free variations in the tonic minor (Nos 4 and 7) and the trenchantly polyphonic final variation, which then pivots the music from B flat to G major for the start of the witty syncopated coda. Beethoven’s friend and pupil Ferdinand Ries tells a colourful story relating to an early performance of the Trio. Present in the audience was a rival virtuoso pianist, Daniel Steibelt, renowned for his vanity and arrogance. At a similar musical gathering the following week, he attempted to trump the Trio’s finale with his own well-prepared ‘improvisation’ on the same aria from L’amor marinaro. Outraged, Beethoven seized the cello part of a quintet by Steibelt, placed it upside down on the piano’s music stand and hammered out a theme from the opening bars with one finger. He then improvised with such fire and brilliance that Steibelt, by now thoroughly humiliated, abruptly left the room and avoided all further contact with Beethoven. The other work on this disc, the Serenade in D major, Op 25, for the airy combination of flute, violin and viola, was long thought to belong to the same period as the Clarinet Trio. Though the evidence is not watertight, 1800–01 now seems more likely, making the Serenade a close contemporary of the popular Septet. Written primarily for the profitable domestic market (since the days of Frederick the Great the flute was the instrument par excellence of the gentleman amateur), the Serenade, like the Septet, is a delightful late offshoot of the eighteenth-century divertimento tradition. Like Mozart in his Salzburg serenades, Beethoven begins with a march-like movement, here titled ‘Entrata’. In the opening fanfare the flute seems to be masquerading as a horn; the strings quickly join in the fun, and the whole movement is full of delicate, quickfire give-and-take between the three instruments. Following tradition, the next movement is a galant minuet with two trios, the first for violin and viola alone, the second a skittering flute solo with a mandolin-style accompaniment. A mock-splenetic D minor Allegro molto leads to the Serenade’s centrepiece, a set of variations on a theme announced by the strings in double stopping to create a quartet texture. The three variations spotlight each of the instruments in succession, first flute (who turns the meditative theme into a frolic), then violin (with skipping triplets) and finally viola. After a frisky scherzo with a gliding, contrapuntal D minor trio, a brief Adagio acts as an introduction to the final rondo, a faintly rustic contredanse with a main theme characterized by piquant ‘Scotch Snap’ rhythms. En novembre 1792, Beethoven quitta son Bonn natal pour Vienne, qui disputait alors à Londres le titre de capitale musicale de l’Europe et où le jeune homme âgé de vingt et un ans projetait d’étudier la composition avec Haydn, avant de se lancer dans une carrière de compositeur–interprète. Grâce à des contacts aristocratiques—indispensables à tout jeune aspirant musicien à Vienne—, il s’imposa rapidement dans les salons de la ville, éblouissant les connaisseurs par ses prouesses de pianiste–improvisateur et par ses compositions brillamment originales. S’il se montrait d’une prudence compréhensible dès qu’il s’agissait de s’attaquer aux genres élevés du quatuor à cordes et de la symphonie—où Haydn, encore au faîte de ses moyens, excellait tout particulièrement—, il était prêt, en revanche, à soutenir une comparaison frontale avec Mozart, mort récemment, comme l’attestent ses deux premiers concertos pour piano, son trio à cordes en mi bémol majeur, op. 3 (façonné d’après le Trio K563 de Mozart) ou sa série d’œuvres de chambre mettant en scène des instruments à vent. Adressé à la même combinaison instrumentale (piano avec hautbois, clarinette, basson et cor), le Quintette K452 de Mozart servit, à l’évidence, de gabarit au Quintette en mi bémol majeur, op. 16 que Beethoven composa probablement à Berlin en 1796—il fut créé en concert à Vienne le 6 avril 1797. Mais cette musique fondamentalement aimable et raffinée a beau beaucoup devoir à Mozart en général (et à son quintette avec piano et vents en particulier), la formulation et les méthodes demeurent proprement beethovéniennes. Là où Mozart avait subtilement entremêlé le piano et le quatuor à vents, Beethoven, travaillant à une échelle plus dilatée, les oppose de façon caractéristique, si bien que les mouvements extrêmes ressemblent parfois à un concerto de chambre pour piano et vents. Beethoven respecte le plan mozartien d’une ouverture dotée d’une majestueuse introduction lente, même si la rhétorique est, comme toujours chez lui, plus emphatique. Autre point typique de l’ensemble de cette œuvre: la manière dont les suaves thèmes cantabile de l’Allegro ma non troppo sont annoncés par le piano puis repris par les vents, avec la clarinette très «primus inter pares». D’emblée, le développement transforme la cadence finale de l’exposition en un ut mineur pseudo-tempétueux, avec des gammes explosives au piano et d’obstinés accents sur les temps forts, avant une série tendue de dialogues entre chaque instrument à vent, sur fond de figurations ondoyantes au clavier. Puis, tandis que Mozart clôt son premier mouvement sur un minuscule appendice, Beethoven choisit de contrebalancer son substantiel développement par une coda de soixante-dix mesures—même si l’idée d’égayer les étapes conclusives par de joyeuses fioritures au cor lui vint très certainement de Mozart. Dans l’Andante cantabile, un simple rondo, des apparitions de plus en plus ornées du thème principal (introduit, comme d’habitude, par le piano seul) ceignent deux épisodes contrastés, l’un qui s’ouvre comme un duo plaintif pour hautbois et basson, l’autre, dans la sombre et difficile (pour les vents) tonalité de si bémol mineur, qui met en scène un majestueux solo de cor interrompu par un bref développement du thème principal. Pour son finale, Beethoven, s’inspirant tant de Mozart (concertos pour cor et divers concertos pour piano) que de son propre Concerto pour piano en si bémol (no 2), écrit un entraînant Rondo «de chasse» à 6/8. De brefs aperçus de la truculence beethovénienne sont perceptibles dans l’épisode central, où le thème du rondo surgit brusquement en mi bémol mineur. Autrement, l’atmosphère est à l’exubérance débridée, jusqu’à la coda, dont le jeu taquin avec le thème ne rappelle pas tant Mozart que l’ancien maître de Beethoven: Haydn. Soucieux de ses ventes, Beethoven publia également le Quintette avec piano et vents sous forme d’arrangement pour piano et trio à cordes. De même, il optimisa le potentiel commercial de son Trio en si bémol majeur, op. 11, composé en 1797–8 pour la combinaison (alors rare) clarinette/violoncelle/piano, mais aussi conçu pour pouvoir être joué, avec un minimum d’ajustements, par un trio avec piano conventionnel. (Hormis une fois, vers la fin du premier mouvement, la clarinette ne descend jamais au-delà de l’étendue du violon, dans son moelleux registre de chalumeau.) Comparé aux trios, op. 1 en quatre mouvements, quasi symphoniques, composés quelques années auparavant, le Trio en si bémol, en trois mouvements seulement, est une œuvre élégamment détendue. Ou du moins le semble-t-il car, à sa publication, le critique de l’influente Allgemeine musikalische Zeitung le jugea «difficile» et reprocha à Beethoven son écriture «artificielle»! L’Allegro con brio, au plan vague, déborde d’une intelligence et d’une ingéniosité toute beethovéniennes, avec le piano et la clarinette tour à tour complices et rivaux dans leur soif de prééminence. Ainsi, après une emphatique conclusion fortissimo à la dominante (fa majeur), le piano, ironiquement interrompu par le violoncelle, détourne discrètement la musique sur ré majeur et sol mineur avant que l’attendu «second sujet» (un air dolce, joliment troussé et rythmiquement apparenté au premier) ne prenne le large à la clarinette. Le splendide thème de l’Adagio en mi bémol—parent plus expressif du menuet de la Sonate pour piano en sol majeur, op. 49 no 2, quasi contemporaine—offre au violoncelle son premier vrai moment de gloire. Le cœur du mouvement est marqué par une époustouflante modulation éloignée, à la Haydn, de mi bémol mineur à mi majeur; puis, une fois mi bémol majeur restauré, le thème principal est peu à peu accaparé par la clarinette, de nouveau sur fond d’étincelante figuration au clavier. Probablement le clarinettiste viennois Joseph Bähr, destinataire de ce Trio, suggéra-t-il à Beethoven de prendre pour thème du finale-variation l’un des numéros favoris du nouvel opéra-comique de Joseph Weigl, L’amor marinaro («L’amour en mer»), créé à Vienne en octobre 1797. Selon son élève Carl Czerny, Beethoven envisagea souvent d’écrire un autre finale, l’original lui paraissant probablement trop léger. En réalité, ces neuf variations sont parmi les plus inventives du Beethoven première manière, avec plusieurs grands moments: la no 2, de texture parcimonieuse, pour clarinette et violoncelle solo; les deux variations libres dans le mineur de la tonique (nos 4 et 7) et la dernière variation, à la polyphonie tranchante, qui fait passer la musique de si bémol à sol majeur pour le début de la spirituelle coda syncopée. Ferdinand Ries, qui fut à la fois l’élève et l’ami de Beethoven, rapporte une anecdote savoureuse sur l’une des premières exécutions du Trio, qui se déroula en présence de Daniel Steibelt. Dans la semaine qui suivit, ce pianiste virtuose, rival de Beethoven et célèbre pour sa vanité comme pour son arrogance, tenta de faire encore mieux que le finale du Trio et donna, lors d’une autre réunion musicale, sa propre improvisation, bien préparée, sur la même aria de L’amor marinaro. Outré, Beethoven empoigna la partie de violoncelle d’un quintette de Steibelt, la plaça à l’envers sur le pupitre du piano et martela, avec un doigt, un thème tiré des mesures d’ouverture. Puis il improvisa avec une telle flamme, un tel brio que Steibelt, profondément humilié, quitta brusquement la salle, évitant dès lors tout contact avec Beethoven. La dernière œuvre de ce disque, la Sérénade en ré majeur, op. 25, fut longtemps considérée comme contemporaine du Trio avec clarinette et ce du fait de son aérienne combinaison flûte/violon/alto. Quoique les preuves ne soient pas inattaquables, la date de 1800–01 semble désormais privilégiée, ce qui place cette Sérénade à la même époque que le populaire Septuor. Écrite avant tout pour le juteux marché de la Hausmusik (depuis Frédéric le Grand, la flûte était l’instrument par excellence du gentilhomme amateur), cette pièce est, tout comme le Septuor, un délicieux et tardif rejeton de la tradition dix-huitiémiste du divertimento. À l’instar de Mozart dans ses sérénades salzbourgeoises, Beethoven commence ici par un mouvement alla marcia, intitulé «Entrata». Dans la fanfare initiale, la flûte semble travestie en cor; puis, les cordes prennent vite part à cette joie et l’ensemble du mouvement déborde d’un échange, délicat et vif, entre les trois instruments. Comme le veut la tradition, le mouvement suivant est un galant menuet avec deux trios, l’un pour violon et alto solo, l’autre mettant en scène un virevoltant solo de flûte avec un accompagnement de type mandoline. Un Allegro molto en ré mineur, pseudo-atrabilaire, mène au cœur de la Sérénade: un corpus de variations sur un thème annoncé par les cordes en doubles cordes pour créer une texture de quatuor. Les trois variations mettent en lumière les trois instruments à tour de rôle—d’abord la flûte (qui fait du thème méditatif une badinerie), puis le violon (avec des triolets bondissants) et enfin l’alto. Passé un fringant scherzo, avec un furtif trio en ré mineur contrapuntique, un bref Adagio fait office d’introduction au rondo final, une contredanse vaguement rustique avec un thème principal caractérisé par de piquants rythmes lombards. Im November 1792 verließ der 21-jährige Beethoven seine Heimatstadt Bonn und wandte sich nach Wien, das damals mit London um die Anerkennung als „musikalische Hauptstadt Europas“ wetteiferte. Beethoven plante, bei Haydn Komposition zu studieren und dann als Komponist und Interpret in Erscheinung zu treten. Mithilfe seiner Verbindungen in aristokratischen Kreisen—für einen ehrgeizigen jungen Musiker in Wien unerlässlich—schuf sich Beethoven in den Gesellschaftszimmern der Stadt bald einen Namen, indem er die Musikliebhaber mit seinen erstaunlichen Fähigkeiten als Pianist und Improvisator und mit seinen außerordentlich originellen Kompositionen beeindruckte. Es ist zu verstehen, warum sich Beethoven nur mit Vorsicht an die gehobenen Gattungen Streichquartett und Sinfonie wagte, in denen sich der noch immer im Vollbesitz seiner Kräfte befindliche Haydn besonders hervortat. Beethoven scheute aber nicht den direkten Vergleich mit dem kürzlich verstorbenen Mozart in solchen Werken wie den ersten zwei Klavierkonzerten, dem Streichtrio in Es-Dur, op. 3 (das sich an Mozarts Trio KV563 ein Vorbild nahm) und diversen Kammermusikkompositionen für Blasinstrumente. Die Vorlage für Beethovens Quintett in Es-Dur, op. 16 für Klavier und Bläser lieferte eindeutig Mozarts Quintett KV452 für die gleiche Besetzung (Klavier mit Oboe, Klarinette, Fagott und Horn). Beethovens Werk wurde wahrscheinlich 1796 in Berlin komponiert und am 6. April 1797 in einem Konzert in Wien uraufgeführt. Zwar ist diese im Wesentlichen freundliche, urbane Musik Mozart im Allgemeinen und dessen Klavier- und Bläserquintetten im Besonderen verschuldet, aber am Ton und den Methoden erkennt man unmissverständlich Beethoven. Mozart hatte das Klavier und Bläserquartett subtil miteinander verflochten. Der in größeren Dimensionen denkende Beethoven stellte sie wie zu erwarten einander gegenüber, so dass die Außensätze bisweilen einem Kammerkonzert für Klavier und Bläser gleichen. Beethoven nahm Mozarts Anfangsidee auf und begann ebenso mit einer majestätischen langsamen Einleitung, auch wenn sich die Rhetorik durch einen für Beethoven typischen stärkeren Nachdruck auszeichnet. Charakteristisch für das gesamte Werk ist auch die Art, mit der die geschmeidigen, cantabile vorzutragenden Themen des Allegro ma non troppo zuerst vom Klavier allein angekündigt und dann von den Bläsern aufgenommen werden, wobei die Klarinette eindeutig die führende Rolle übernimmt. Die Durchführung transformiert die abschließende Kadenz sofort in ein pseudostürmisches c-Moll mit explosiven Klavierläufen und boshaften Gegenakzenten gegen den Grundschlag. Ihnen schließt sich eine Abfolge von gespannten Dialogen zwischen den einzelnen Blasinstrumenten an, während gleichzeitig kräuselndes Figurenwerk im Klavier abläuft. Wo Mozart seinen ersten Satz mit einem winzigen Nachsatz abrundete, schuf Beethoven mit einer 70-taktigen Koda ein Gegengewicht zu seiner umfangreichen Durchführung. Von Mozart borgte er sich aber sicher den Gedanken, das abschließende Geschehen mit ausgelassenen Hornfiguren zu beleben. Das Andante cantabile ist in einfacher Rondoform gehalten, in der zunehmend verzierte Erscheinungen des Hauptthemas (das wie üblich vom Klavier allein vorgestellt wurde) zwei kontrastierende Episoden umschließen. Die erste Episode beginnt wie ein klagendes Duett für Oboe und Fagott, während sich die in der düsteren und (für Bläser) schwierigen Tonart b-Moll stehende zweite Episode durch ein nobles Hornsolo auszeichnet, das durch eine kurze Durchführung des Hauptthemas unterbrochen wird. Im Schlusssatz des Quintetts folgte Beethoven wieder dem Vorbild Mozarts (wie jener es in seinen Hornkonzerten und diversen Klavierkonzerten vorgab) und seines eigenen Klavierkonzerts Nr. 2 in B-Dur und komponierte ein federndes „Jagd“-Rondo im 6/8-Takt. Die für Beethoven typische Aufsässigkeit macht sich im Mittelabschnitt kurz bemerkbar, wo das Rondothema plötzlich in es-Moll erklingt. Aber sonst herrscht durchweg ungezäumte Ausgelassenheit, einschließlich der Koda, in der das neckische Spiel mit dem Thema weniger Mozart als Beethovens ehemaligen Lehrer Haydn in Erinnerung ruft. In der Hoffnung auf gesteigerten Umsatz veröffentlichte Beethoven dieses Quintett für Klavier und Bläser auch in einer Fassung für Klavier und Streichtrio. Genauso erhöhte er das Verkaufspotential des Trios in B-Dur, op. 11, das 1797–98 für die damals seltene Besetzung aus Klarinette, Violoncello und Klavier entstand, aber so gestaltet war, dass es mit geringfügiger Abänderung auch von einem konventionellen Klaviertrio gespielt werden konnte. (Außer an einer Stelle gegen Ende des ersten Satzes bewegt sich die Klarinette niemals hinab in ihr öliges Chalumeauregister, das unter dem Tonumfang der Violine liegt.) Verglichen mit den einige Jahre zuvor komponierten, fast sinfonischen, viersätzigen Trios op. 1 ist das nur dreisätzige Trio in B-Dur ein Werk eleganter Entspannung. Zumindest hört es sich heute so an. Als es im Druck erschien, fand jedoch der Rezensent der einflussreichen Allgemeinen musikalischen Zeitung das Trio „schwierig“. Er hielt Beethoven zudem vor, „unnatürlich“ komponiert zu haben! Das großräumig angelegte Allegro con brio ist reich an für Beethoven typischer Schlagfertigkeit und Erfindungsgabe. Hier intrigieren und streiten das Klavier und die Klarinette um Vorherrschaft. Zum Beispiel lenkt das spöttisch vom Violincello unterbrochene Klavier nach einer emphatischen, auf der Dominante (F-Dur) schließenden Kadenz im Fortissimo die Musik listig nach D-Dur und g-Moll, bevor das erwartete „zweite Thema“ (eine wohlgeformte, dolce vorzutragende Melodie, die rhythmisch dem ersten Thema verwandt ist) auf der Klarinette daherschwebt. Das schöne Thema des in Es-Dur stehenden Adagio, das mit dem Menuett aus der fast zur gleichen Zeit entstandenen Klaviersonate in G-Dur, op. 49, Nr. 2 verwandt, wenn auch empfindsamer ist, erlaubt dem Violoncello seinen ersten richtigen großen Auftritt im Werk. In der Mitte des Satzes geschieht eine atemberaubende Modulation à la Haydn von es-Moll zum fern gelegenen E-Dur. Nach der Wiedereinführung von Es-Dur vereinnahmt dann die Klarinette das Hauptthema auf dem Hintergrund funkelnd virtuoser Klavierfiguren. Wahrscheinlich schrieb Beethoven das Trio für den Wiener Klarinettisten Joseph Bähr, der das Thema für den als Variationsreihe angelegten Schlusssatz vorschlug: eine beliebte Nummer aus Joseph Weigls neuer komischer Oper L’amor marinaro („Liebe auf dem Meer“), die im Oktober 1797 in Wien Premiere hatte. Beethoven habe sich, nach Aussagen seines Schülers Carl Czerny, häufig überlegt, einen neuen Schlusssatz zu komponieren, vermutlich, weil er den ersten zu seicht fand. Aber eigentlich gehören diese neun Variationen zum Einfallsreichsten, das Beethoven in seinen frühen Jahren schrieb. Höhepunkte stellen der ausgesparte Stimmsatz in der zweiten Variation für ausschließlich Klarinette und Violoncello, die zwei freien Variationen in der Molltonikavariante (Nr. 4 und 7) und die schneidend polyphone Schlussvariation dar, wo die Musik für den Einsatz der witzigen synkopierten Koda von B-Dur nach G-Dur umschlägt. Beethovens Freund und Schüler Ferdinand Ries erzählte eine illustre Geschichte über eine frühe Aufführung des Trios. Im Publikum saß der für seine Eitelkeit und Arroganz bekannte Konzertpianist und Rivale Beethovens Daniel Steibelt. Bei einer ähnlichen musikalischen Zusammenkunft eine Woche später versuchte Steibelt, den Schlusssatz des Trios mit seiner eigenen, umfangreich vorbereiteten „Improvisation“ über die gleiche Arie aus L’amor marinaro zu übertrumpfen. Vor Wut schäumend nahm Beethoven die Violoncellostimme eines Quintetts von Steibelt, stellte sie umgekehrt auf das Notenpult des Klaviers und hämmerte mit einem Finger ein Thema aus den Anfangstakten heraus. Dann improvisierte er mit solch einem Feuer und solcher Brillanz, dass der nun völlig beschämte Steibelt abrupt das Zimmer verließ und seitdem jeglichen Kontakt mit Beethoven vermied. Von dem anderen Werk auf der hier vorliegenden CD, der Serenade in D-Dur, op. 25 für die Kombination aus den relativ hoch gelegenen Instrumenten Flöte, Violine und Bratsche, nahm man lange an, es würde aus der gleichen Periode stammen wie das Klarinettentrio. Selbst wenn die Beweislage nicht hundertprozentig gesichert ist, scheint nun 1800–01 wahrscheinlicher, wodurch die Serenade in die zeitliche Nachbarschaft des beliebten Septetts rückt. Sowohl das Septett als auch die Serenade wurden hauptsächlich für den profitablen Binnenmarkt geschrieben (seit Friedrich dem Großen war die Flöte für den Amateurmusiker das Instrument schlechthin) und stellen reizende Nachzügler der Divertimentotradition des 18. Jahrhunderts dar. Wie Mozart in seinen Salzburger Serenaden beginnt Beethoven mit einem marschartigen Satz, die hier den Titel „Entrata“ erhielt. In der einleitenden Fanfare scheint sich die Flöte als Horn ausgeben zu wollen. Die Streicher schließen sich dem Spaß bald an. Der ganze Satz ist vom delikaten, spritzigen Austausch zwischen den drei Instrumenten geprägt. Der Tradition entsprechend ist der nächste Satz ein galantes Menuett mit zwei Trios, das erste für Violine und Viola allein, das zweite ein hurtiges Flötensolo mit mandolinartiger Begleitung. Ein auf angeschlagen mimendes Allegro molto in d-Moll führt zum Herzstück der Serenade: eine Variationsreihe über ein Thema, das von den Streichern mit Doppelgriffen angekündigt wird und so einen vierstimmigen Satz vortäuscht. Die drei Variationen stellen nacheinander jedes einzelne Instrument vor, zuerst die Flöte (die das meditative Thema in Ausgelassenheit umwandelt), dann die Violine (mit federnden Triolen) und schließlich die Viola. Nach einem munteren Scherzo mit einem gleitenden, kontrapunktischen Trio in d-Moll agiert ein kurzes Adagio als Einleitung zum abschließenden Rondo, einem schwach rustikalen Kontretanz mit einem Hauptthema, das sich durch pikante, aus Sechzehnteln und punktierten Achteln bestehende Rhythmen auszeichnet.